Arsenal will on Thursday face BATE Borisov without Aaron Ramsey, Mesut Ozil and Sokratis Papastathopoulos. 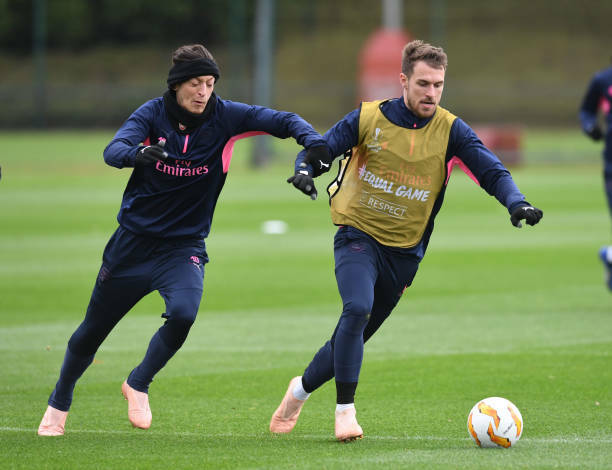 The Arsenal squad has already arrived in Belarus ahead of their match against BATE Borisov but the fans have heavily criticized Unai Emery for not including Mesut Ozil in the squad yet the German international had returned to full training. Sokratis Papastathopoulos was also left behind but the Arsenal fans believe that is justifiable since he had just returned from a serious injury and it’s surprising that he is back in full training this early because reports claimed that he would be back at the end of this month. Mesut Ozil has this season been omitted by Unai Emery many times and the Arsenal fans always keep an eye on their squad that travels away from home. Aaron Ramsey missed Arsenal’s match against Huddersfield Town because of a knee injury and it seems he will be out for a while as he was not in the squad that trained on Wednesday before the team traveled. Arsenal head coach Unai Emery faced the media after arriving in Belarus and he was asked about the players ( Ramsey, Sokratis and Ozil ) that were left behind. The boss says that Ozil and Sokratis haven’t had enough training. “The players we didn’t bring in the squad were because Aaron Ramsey did not train with us and Sokratis only started training yesterday [Tuesday] and today – I think it’s enough.” Unai Emery told Football.London.